(Bloomberg) -- Argentina’s economy sharply contracted in the fourth quarter while unemployment rose, potentially hurting President Mauricio Macri’s approval ratings as he seeks re-election later this year. Gross domestic product fell 6.2 percent from a year ago, the country’s statistics institute said on Thursday. It was the worst quarterly performance since 2009 after the global financial crisis, although Argentine economic data was considered unreliable until 2016. Analysts had forecast a 6.4 percent contraction. 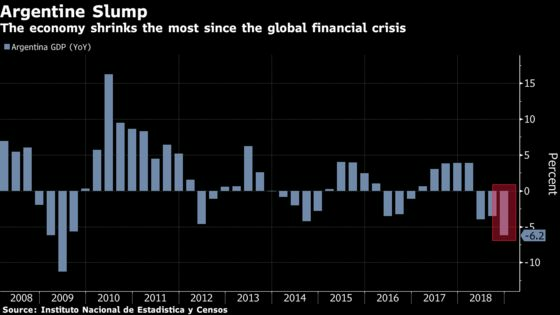 South America’s second-largest economy shrank 2.5 percent last year, the worst since 2014 when the nation defaulted on its debt under the previous government. Unemployment increased a notch to 9.1 percent in the fourth quarter from the previous period. Argentina is grinding through a two-year recession coupled with stubbornly high inflation. That has forced its central bank to take drastic measures to stabilize the peso, which lost 50 percent of its value against the dollar last year. At nearly 65 percent, the bank’s benchmark rate is the highest in the world. Macri, a market favorite who is running for re-election in October, is also significantly cutting spending to comply with the terms of a $56 billion financing program from the International Monetary Fund. The unpopular austerity measures have already hurt his approval rating, which now stand around 35 percent.